Folder #1 is the original smart object(#1.psb as an example) with two folders below it with smart objects and with different effects applied to them. 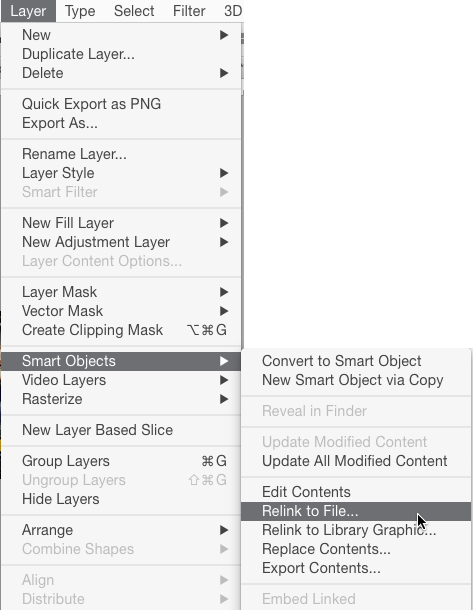 I've duplicated folder #1 and created folder #2, I've clicked on the copy of the original Smart object(#1.psb) and selected Layer> Smart Object> Make Copy of Smart Object VIA Copy (see: New SA via Copy). Now, I have saved the copied smart object as #2.psb(example) and the layer titled "New SA via copy" is linked to the right file. Now, I need to make all the rest of those layers below (in folders "still linked to original") the #2.psb layer link to the file #2.psb as well. Q: Is there a way to achieve this without batch processing, clicking individually for hours, etc. etc. etc. If I were using inDesign I'd click on the duplicated link>relink and everything would be done. In PhotoshopCC it seems rather cumbersome and I've been provided this file. My goal is to just duplicate, change the text and done. Instead I change the text and it changes for folder #1 as well as folder #2 so I made a copy of the Smart Object so that I could just edit that one and then all the effects would tie to it. Unfortunately this isn't working as expected and the linking process is laborious. Not my style. I'm unclear if your Smart Objects are linked to external files or just all linked internally. However..... whether embedded or linked..
That should allow you to relink to an external file. You may need to copy internal Smart Objects and save them as an external files first, and then relink.... but it would still save a lot of repetative clicking. The easiest way possible: make a copy of your entire file and name it something else. Open both files> make changes in the second file>grab the changed layer you want>drag into the other file's tab(in photoshop). This will move everything over and as its own SO + it will create/link a different (read: new) instance of the smart object in the temp folder.